...[O]ur starting-point is the historical figure of Jesus of Nazareth. He certainly existed. There is no reasonable doubt about that. His historicity is vouched for by pagan as well as Christian writers. He was also very much a human being, whatever else may be said about him. He was born, he grew, he worked and sweated, rested and slept, he ate and drank, suffered and died like other men. He had a real human body and real human emotions. But can we really believe that he was also in some sense 'God'? Is not the deity of Jesus a rather picturesque Christian superstition? Is there any evidence for the amazing Christian assertion that the carpenter of Nazareth was the unique Son of God? This question is fundamental. We cannot dodge it. We must be honest. If Jesus was not God in human flesh, Christianity is exploded. We are left with just another religion with some beautiful ideas and noble ethics; its unique distinction has gone. But there is evidence for the deity of Jesus — good, strong, historical, cumulative evidence; evidence to which an honest person can subscribe without committing intellectual suicide. There are the extravagant claims which Jesus made for himself, so bold and yet so unassuming. Then there is his incomparable character. His strength and gentleness, his uncompromising righteousness and tender compassion, his care for children and his love for outcasts, his self-mastery and self-sacrifice have won the admiration of the world. What is more, his cruel death was not the end of him. It is claimed that he rose again from death, and the circumstantial evidence for his resurrection is most compelling. Supposing Jesus was the Son of God, is basic Christianity merely an acceptance of this fact? No. Once persuaded of the deity of his person, we must examine the nature of his work. What did he come to do? The biblical answer is, he 'came into the world to save sinners'. Jesus of Nazareth is the heaven-sent Saviour we sinners need. We need to be forgiven and restored to fellowship with the all-holy God, from whom our sins have separated us. We need to be set free from our selfishness and given strength to live up to our ideals. We need to learn to love one another, friend and foe alike. This is the meaning of 'salvation'. This is what Christ came to win for us by his death and resurrection. 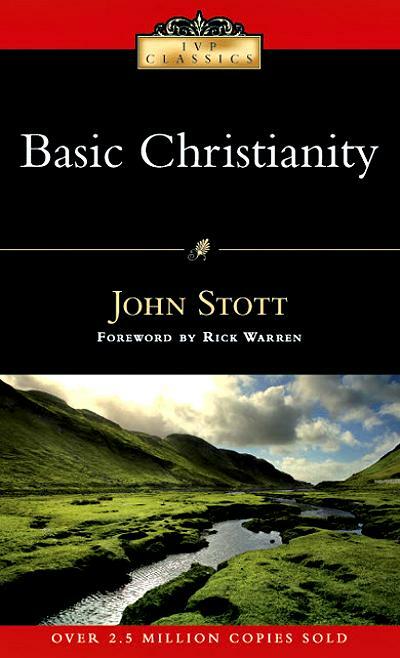 Basic Christianity can be purchase from Amazon here in a variety of formats.